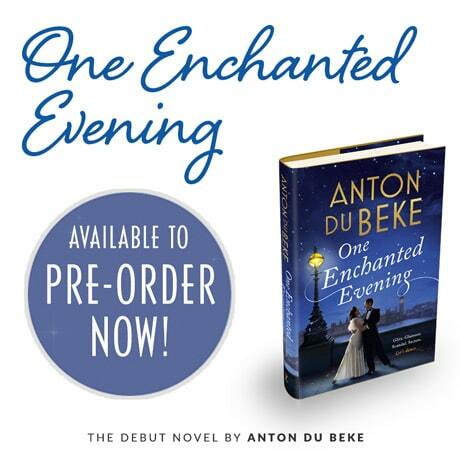 I’m very excited to announce that #OneEnchantedEvening is soon to be released in paperback! To celebrate, my wonderful publishers have organised for me to embark on a week-long signing tour this March. 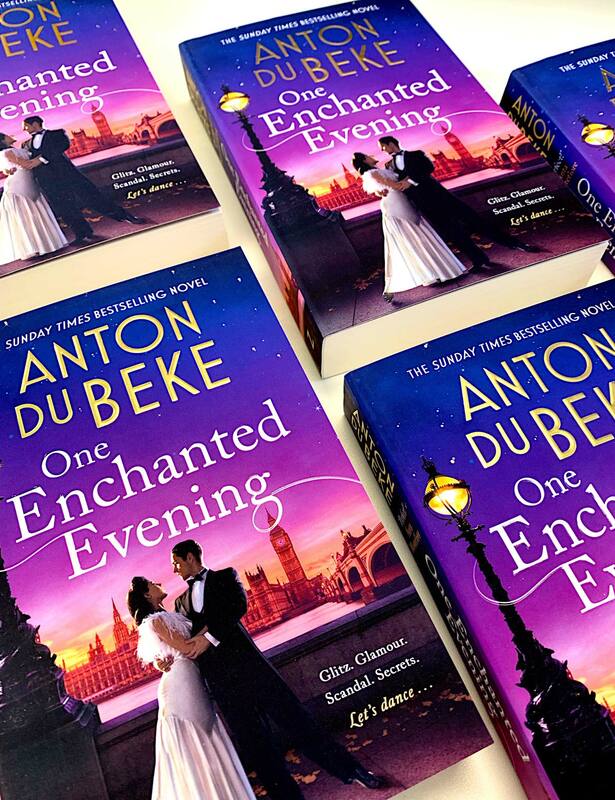 Perfect timing, too, as the dates fall just before Mothers’ Day on the 31st, and I’m sure you’ll agree that a lovely signed copy of ‘One Enchanted Evening’ would make such a delightful gift! One lucky winner at each event will win a very special prize from me! Bluewater – WHSmith Bluewater, Tuesday 26th March, 2pm – public book signing. Shepherd’s Bush – WHSmith Westfield London, Tuesday 26th March, 6.15pm – public book signing. Chichester – Waterstones Chichester, Thursday 28th March, 5pm – public book signing. 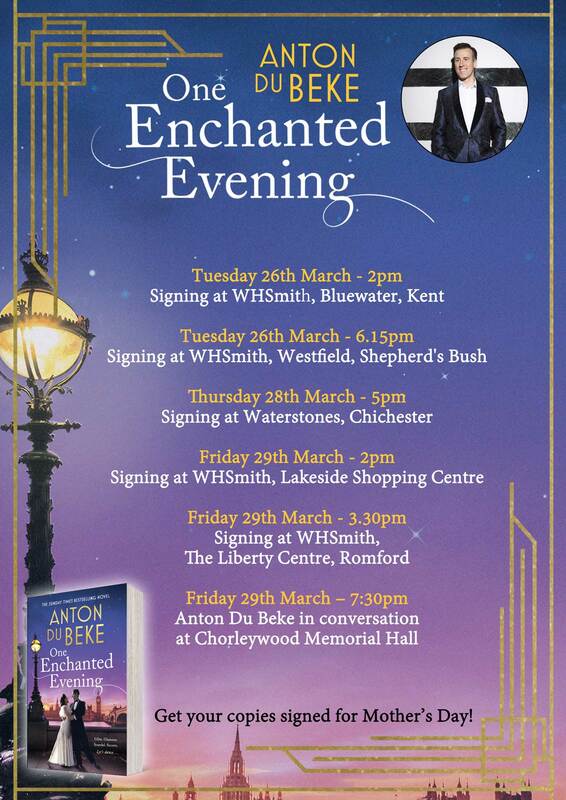 Lakeside – WHSmith, Lakeside Shopping Centre, Friday 29th March, ‎2‎pm – public book signing. Romford – WHSmith, The Liberty Centre, Romford, Friday 29th March, ‎3.30pm – public book signing. 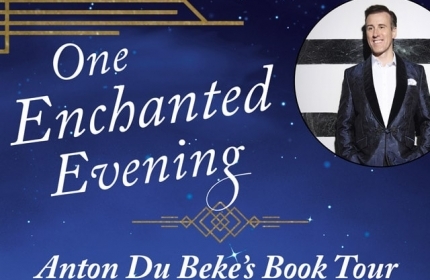 Chorleywood – Chorleywood Memorial Hall, Friday 29th March, ‎7.30pm – Anton Du Beke in conversation about One Enchanted Evening. 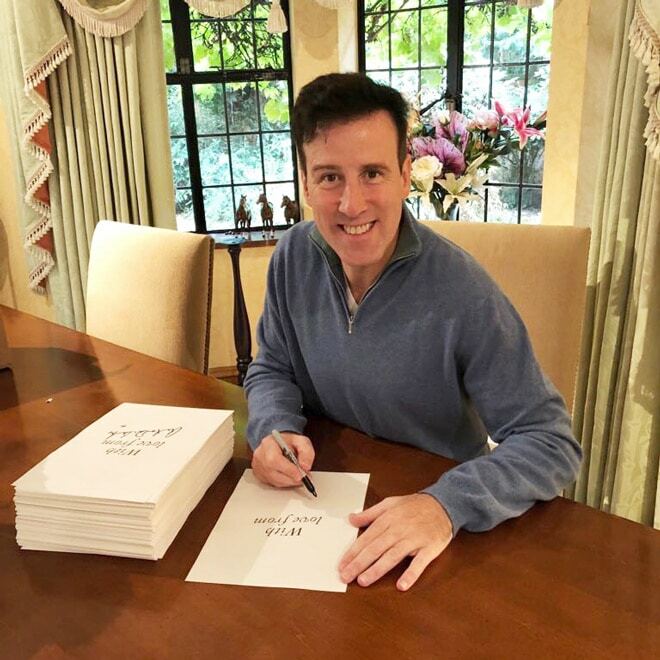 The previous book signing events were such fun – I so enjoyed meeting so many of you and hearing your thoughts on my book. And now, with the paperback soon available, it’ll make such a perfect gift – why not come along so that I can sign it and make it extra special! I’ll post more details about the paperback edition as soon as they’re finalised, including links for purchasing online, but I’m sure you’d rather guarantee yourself a copy – one signed by the author himself(!) – by coming along to one of these unmissable events. I do so hope to see you there! I wanted to share this with you as it’s been something of a transformational experience for me – and it would be wonderful if sharing it could help others in the same boat. Back in 2016 as I rewatched my Strictly performances each week, I noticed that I was starting to go a bit thin at the front. And the more I saw myself on screen and in photos, under those unforgiving spotlights, the more I became aware of it. I’d cover it with make-up and do my best to avoid certain lights, but I didn’t like the situation at all. Image is very important to me. If, as a performer, you’re known for having a good head of hair, should you start to lose it, you lose it very publicly and it can very much affect one’s confidence. I realised that this was something I couldn’t ignore, and of course, that it wasn’t going to improve on its own. I started reading up about the various options for treatment, and it looked like a hair transplant could be the solution I needed. 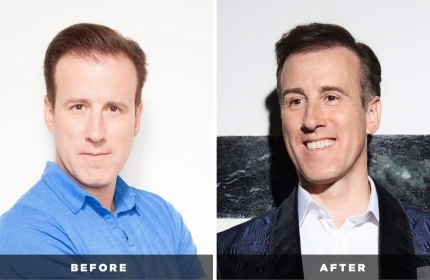 A chance conversation with James Nesbitt had us both talking about our hairloss, and James told me about the tremendous results he’d had from a hair transplant at HRBR – Hair Restoration Blackrock – a very well regarded specialist clinic in Dublin. I immediately arranged for a consultation. You either worry about hair loss, or you don’t worry about it. If you worry about it, then it is a massive thing – and for me it was. I met with the Consultant Surgeon and liked him instantly. I liked the setup of the clinic. The whole thing was just so professional. I knew straight away that I wanted to have my hair transplant performed by HRBR. It was a simple, straightforward procedure, and I knew immediately after having it done that I was delighted. I was very quickly back to work and had thought I’d keep it to myself, all under the radar, but I have to say I was so thrilled with the results I was happy to tell everyone! It’s now two years since the procedure, and I can honestly say it’s changed my life. I feel fantastic, like a new man – it’s given me so much more confidence when appearing on television or having my picture taken and I’m so glad I took action when I did. I wouldn’t hesitate in recommending it to anyone who’s facing hairloss, it’s quite simply the best thing you will ever do for yourself. Tremendous thanks to the marvellous team at HRBR – I feel 25 again! Find out more at HRBR.co.uk. It’s approaching that magical time of year… Christmas!!! 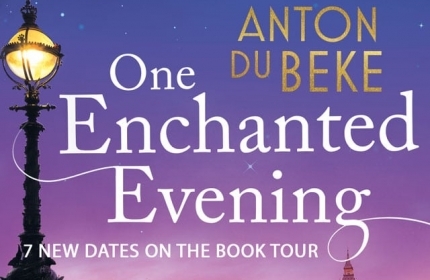 What a busy lead-up it’s been, too, with rehearsals for the pro dances in this weekend’s Strictly Final, rehearsals for my 2019 Tour with Erin, not to mention my recent book signings and Champions Tennis match with Helen Skelton at the Albert Hall! That’s not all… Erin and I are thrilled to announce this year’s ‘Christmas Spectacular‘ at Theatre Royal, Drury Lane. We’ve got an absolute cracker of a show planned for you – and we’ll be treading those hallowed boards along with wonderful Kimberley Walsh, to fabulous sounds of the London Concert Orchestra. We’ll also be joined by Capital Voices, west end singers and the Jingle Belle dancers for a full-on festive extravaganza! Featuring seasonal song sing-alongs and a phenomenal snow-filled finalé, this promises to be the ultimate unmissable Christmas party… with all the trimmings! We’ve a matinée and evening performance this coming Sunday, 16th December, and another two performances the following Sunday, 23rd December. Click through for full details and booking links. See you in the audience – it’s going to be just the perfect winter warmer! If your browser/device doesn’t support this, listen on Soundcloud. 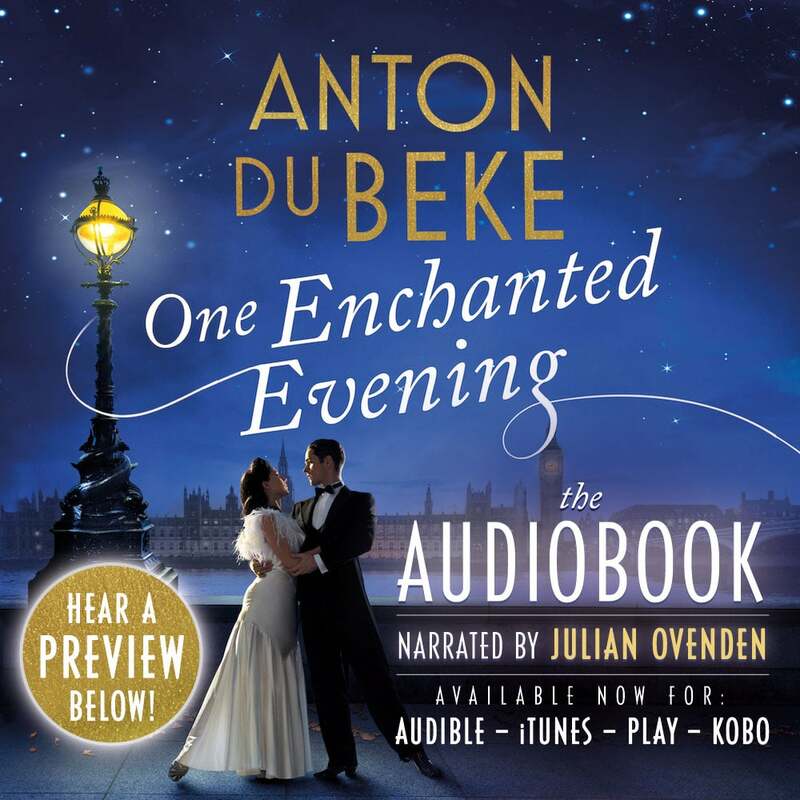 I’m excited to let you know that ‘One Enchanted Evening’ has been released as an Audiobook – and a 5 minute excerpt is available above for you to listen to as a preview! 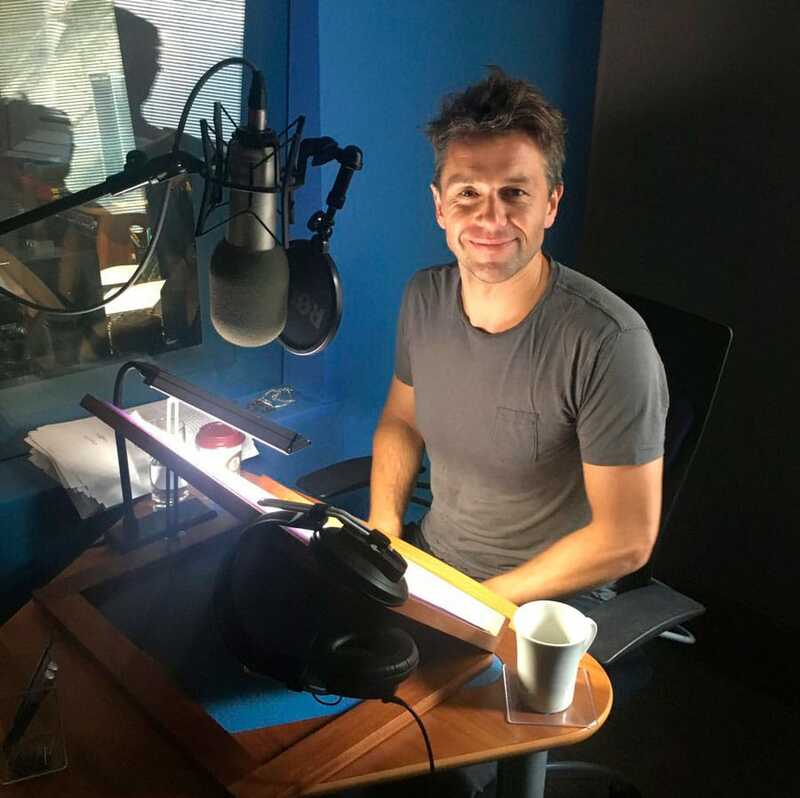 What could be more perfect than sitting back and enjoying my debut novel being read aloud to you by the acclaimed actor and singer, Julian Ovenden? Perfect for a quiet night in by the fire, or to keep you company in the car on a long drive, or on your headphones when you’re on a bus or train, or simply out and about. And it’s especially perfect for Christmas! 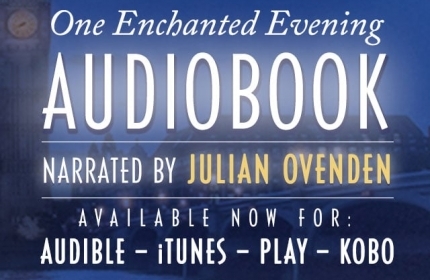 There’s something very magical about having a story read aloud, and that’s why I’m so particularly thrilled that my publishers have produced this Audiobook – it really brings ‘One Enchanted Evening’ to life all the more, and I think Julian has done a wonderful job as narrator with his marvellously distinctive voice. It’s available now, in all the major formats… Enjoy! 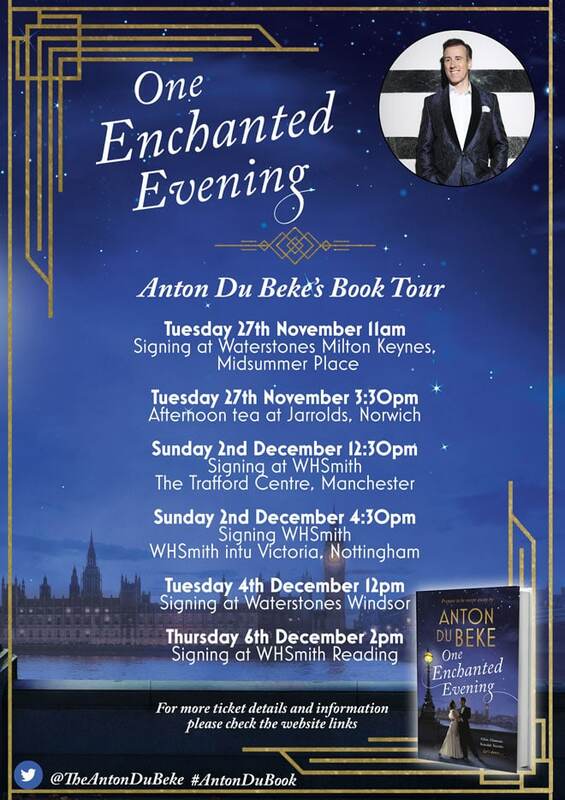 Don’t forget – my book signing tour is in full swing at the moment!… I’ll be in Manchester and Nottingham this coming Sunday, 2nd December, Windsor on Tuesday the 4th December, and Reading on Thursday the 6th December. Whether you prefer audio books, or e-books, or good ol’ fashioned hardbacks, I so do hope you enjoy my novel. Treat yourself or a loved one this Christmas and let’s take a spin around the beautiful Grand Ballroom at the Buckingham Hotel together! 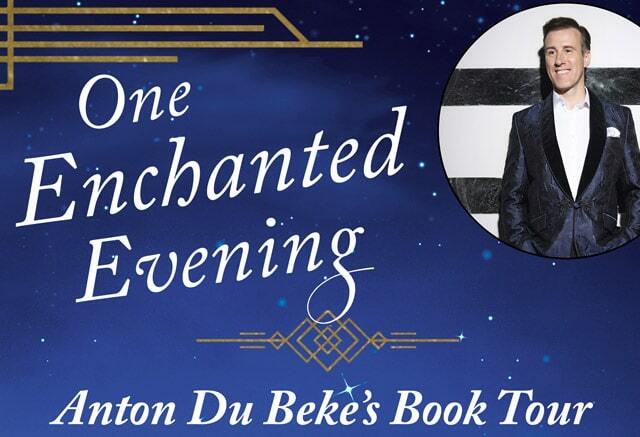 I’m very excited to announce more dates on my book signing tour! The first four events were such a success – it really was thrilling that so many of you came along to listen to me talk about the background and inspiration for the story. 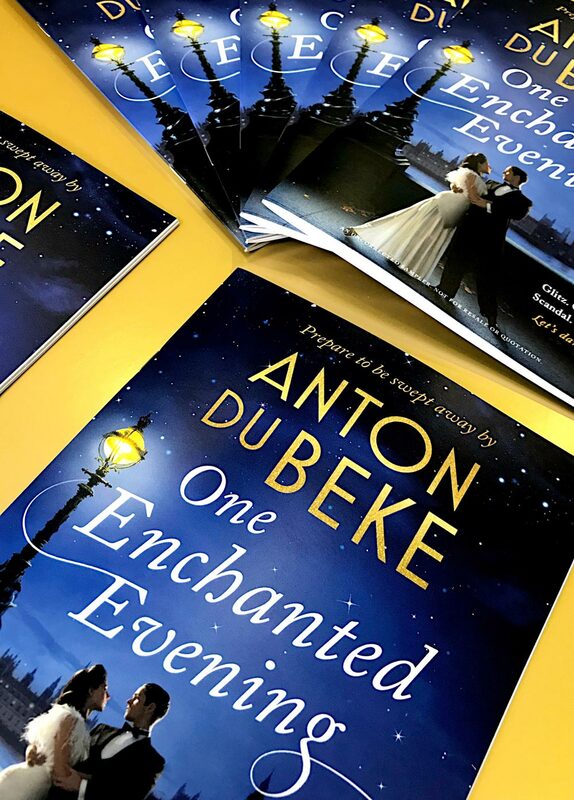 And of course, it was such a pleasure to meet you all, sign your books, and to have the opportunity to hear what you thought about my debut novel, ‘One Enchanted Evening’. The feedback has been overwhelmingly positive and such an encouragement to me (especially the countless requests for a sequel! )… and so by popular demand, my publishers have very kindly extended the Tour! Milton Keynes – Waterstones Milton Keynes, Tuesday 27th November, 11am – public book signing. Norwich – Jarrolds, Tuesday 27th November, 3.30pm – Afternoon Tea and In Conversation event. Manchester – WHSmith The Trafford Centre, Sunday 2nd December, 12.30pm – public book signing. Nottingham – WHSmith intu Victoria, Sunday 2nd December, 4.30pm – public book signing. Windsor – Waterstones, Tuesday 4th December, 12 noon – public book signing. Reading – WHSmith, Thursday 6th December, 2pm – public book signing. I do hope you can come along so I can share with you the insights and inspirations behind all the goings on at the Buckingham Hotel! If you can’t make the above events, there are still some signed editions available to purchase in the WHSmith online store – click the link below… and other formats are available too, such as for tablet devices if you’re technically-minded! Audiobook also available – free preview! 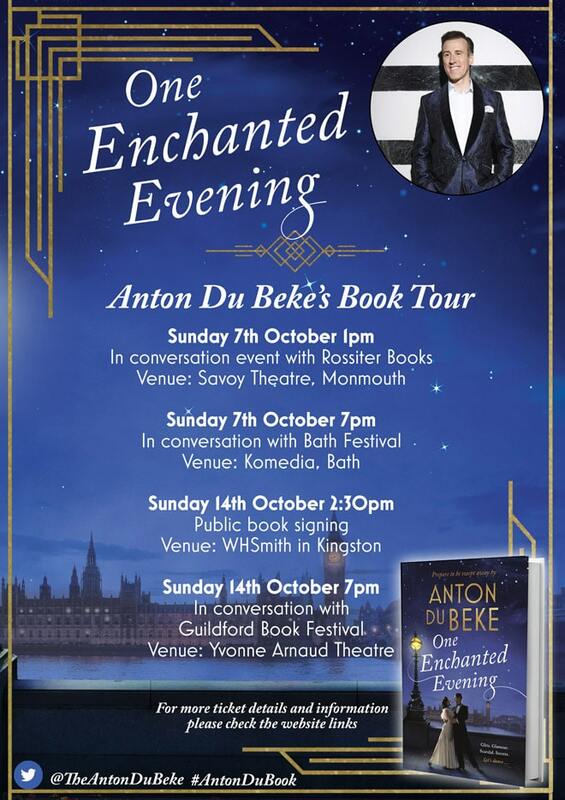 I do hope to see you at one of these events so I can sign your copy in person! 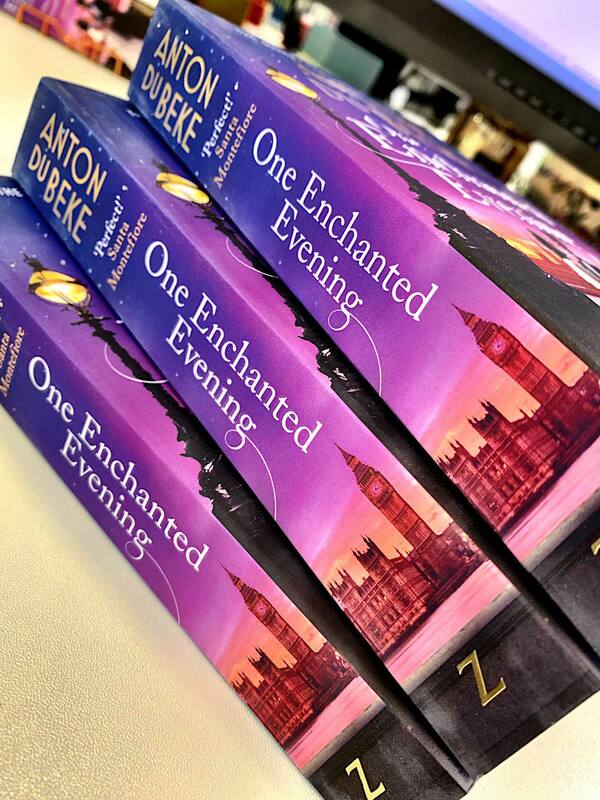 I’m thrilled, excited, and incredibly proud to announce that my debut novel ‘One Enchanted Evening’ is out today! I’d like to share with you a fabulous teaser trailer video prepared by my publishers, with a voice-over extract of the novel read by yours truly! Don’t forget, there are two book signing events this coming Sunday, 7th October – in Monmouth and Bath – and then the 14th October in Kingston and Guildford. Keep an eye on my blog and social media for news of additional dates, too. 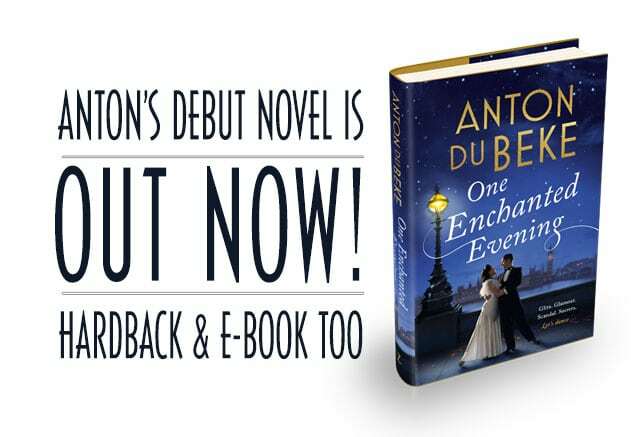 I do so hope you enjoy reading my novel – please let me know via Facebook or Twitter – I’d love to hear from you! After the lows, and low scores of our week 1 samba, I was a firm believer that the only way was up from our position at the bottom of the leaderboard. Oh how wrong I was! 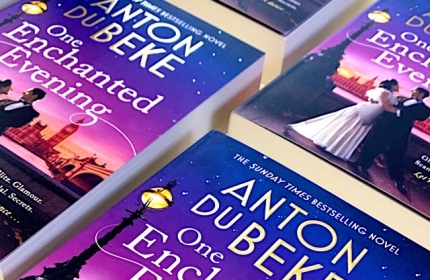 Read on to find out more about our untimely departure, #AntonDuBekxit, and what’s in store for the coming months! Week 2 was our week to shine after our disappointing dance debut, and we felt sure our classy slow Foxtrot would be a winner with the judges this week. Didn’t we look the part, too – dressed to the nines as we stepped out from underneath the arbour, Dave Arch’s flaring trumpets giving us our cue – what a stylish entrance for our comeback performance. As we took to the floor, we went straight into a little side-by-side section to get us us into the swing of the dance, and we were off! All felt good and right, and things went reasonably well, until I think the nerves crept in and, well, the steps all seemed to be there alright, just not quite in the right order! There may have been a slight footwork fracas in the far corner as we negotiated a turn, but we got ourselves back on track and brought the routine to a graceful close on time, in the right place, and with great aplomb! Beautifully done! Such wonderful music to have the opportunity to dance to, that Ol’ Blue Eyes number “They Can’t Take That Away” – emotively performed by the Strictly band – and to dance a proper ballroom number too, what a treat! The treat was short-lived however as we braced ourselves for the judges’ comments. I’m afraid Craig didn’t find anything more positive than last week – “even the smoke sadly couldn’t hide that dance disaster,” he chimed, to which Darcey gave him a slap on the wrist. She was more positive but did recognise Susannah’s fleeting lapses in concentration (which she herself admits), but noted that she kept her smile throughout. Shirley said there was definitely an improvement over last week, which was news very gratefully received. Bruno, however, said I could have got better movement out of a lamppost. The crowd quite rightly erupted with boos! I was enormously proud, and so pleased that Susannah said she enjoyed the dance – ultimately, that’s the most important thing – if you don’t enjoy doing something you’re never going to improve at it – and that’s one very good reason why constructive criticism is so important for our novice dancers. The scores, I’ll admit, came as a surprise. Given our 12 points from last week, I had every expection of improving on both score, and position, this week. “The only way is up,” I believe I wrote in my last blog post. I hadn’t factored on staying firmly put where we were! Even though Tess had broken his ‘1’ paddle, Craig must have commandeered a spare during our number, as that was all he gave us. Darcey and Shirley both gave us 4s, and Bruno a 3. Lo and behold: 12 points. Again. Bottom of the leaderboard… Again! Oh dear, we both knew we were in trouble, but saw opportunity in being able to perform again and nail it in the inevitable dance-off. Sunday night came, and as we suspected, we were bathed in that terrifying red light. Mind you, they’d kept us waiting until the very end to find out – it felt like an eternity – but when it was finally between us and Kate & Aljaz, we knew if was going to be us. And in fact, with Lee and Nadiya already pegged for the dance off, we had a good idea where this was all heading. Susannah said to Tess that she thought she was improving, but that she’d feel bad if another couple were in our place – to which I begged to differ, but that’s the competitive dancer in me! When asked for some last minute advice, Craig suddenly mellowed (or had a moment of madness!) and gave Susannah quite a marvellous pep talk for which I was most grateful. All that was left was for us to take to the floor and dance as though it would be our last. Without the same pressure and nerves, the celebrities can often perform so much better and thow themselves fully into the dance. And that’s just what Susannah did. We weren’t going out without a fight! I thought she danced marvellously and I couldn’t have been more proud… but alas, t’was not to be: worthy rivals Lee & Nadiya won the judges votes and the last ticket through to Strictly Movie Week. All too brief, all too brief, my loves. Huge congratulations to all the other couples for making it through, but huge commiserations for Susannah, and for her Strictly experience to have been cut so short. We’ve had such a wonderful three weeks in training, we clicked instantly and were completely on the same wavelength – so our time together in the studio hardly felt like work at all, even though we did work tirelessly. Perhaps different dances would have enabled her to build up more confidence in the performances, I’m sure luck of the draw plays a crucial part in the early rounds. And I know Susannah was looking forward to our Movie Week Charleston – now that would have been definitely worth more than a 12! Ah, we’d barely just begun! Well my loves, this brings us to the fact that this series has resulted in my earliest Strictly exit – a disappointment, yes indeed, as it would be for any competitor, but we both have had a truly wonderful time training, rehearsing, dancing – and laughing together. I shall certainly miss our partnership, and I very much hope Susannah has caught the dancing bug and will continue to build on the fabulous progress she’s already made. As the news of our exit broke across the tabloids earlier this week, so too did quite a number of ‘fake news’ stories, too. It was widely reported that I was quitting Strictly. What rubbish! 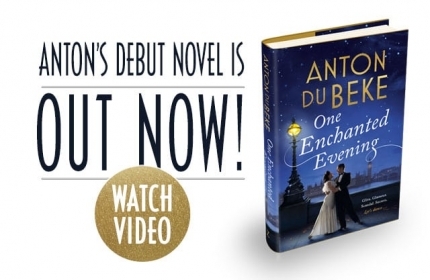 I even had to make a public announcement to that effect, which Gabby Logan turned into a bit of ‘a thing’ on twitter: “Anton Du Bekxit”. I roared, you can imagine! Believe you me, I’ll be back every year whether they want me or not… and one day I’ll make it all the way to the Grand Final and lift that Glitterball aloft! The king of ballroom has spoken! And so, my loves, I’ll sign off here. I’ll of course be back for the Pro Dances throughout the rest of the series, so look out for me in those. Meanwhile, it’s all go this week as my debut novel is released TOMORROW! You can find out more about that, and how to order a signed copy here on my blog. Do keep a watch on social media too as there’ll be more announcements to come, including additional dates on my book tour! And don’t forget, I’ll be heading off on tour with Erin next January with our new show “Dance Those Magical Musicals” – full details, dates and booking links can be found here: antonanderinlive.co.uk – Erin and I hope to see you in the audience! Until then my loves, keeeeep dancing! I shan’t reveal whose idea it was for me to make my entrance from secret doors in my partner’s skirt, but it was clearly inspired. I’ve never known anything like it! 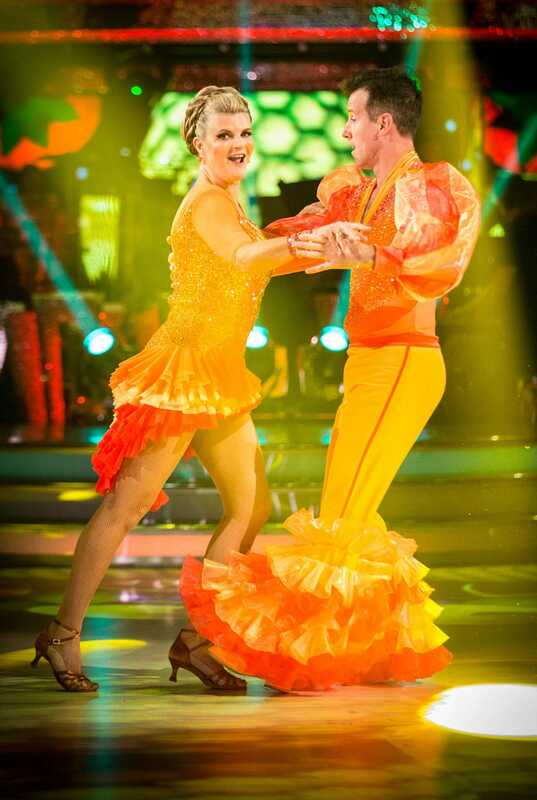 Another first for Strictly – as indeed, was dancing a Samba in week 1. To tackle the samba as an introduction to Strictly is undoubtedly a baptism of fire. Just when your partner starts to believe they have some mastery over the steps and a feel for the performance, it can all be undone by nerves and the pressure of delivering such a fast, high-energy dance. It’s understandable, as I’m sure you’ll agree, that nerves may have got the better of Susannah at times in terms of recalling the steps, but those very same nerves have surely now been steeled by the experience. I happen to think Susannah did tremendously well for a complete novice and a debut dance like that. She delivered a good number of basic steps – at speed, too: whisks, voltas, the corta jaca, promenade runs; and whilst of course there’s room for improvement, this was week 1 – it was all about her finding her feet and getting a performance under her belt. Did you spot the stray maracas on the dance floor throughout (ah, the joy of props!) – it was a bit like dodging giant marbles at times, so how that didn’t put us both off I don’t know! I’m not sure I could actually see my feet or the floor for that matter will all those leg frills! Hats off to Susannah though for getting through the dance in grand style – and reaching the floorspin finale on time too – no mean feat. For me, it’s a clear indication of her determination, her enthusiasm and her ability – I’m also mightily encouraged by the fact she’s proving to be a rather good mover! Of course, the judges took a direct line with their critique… though I’m pleased to say Darcey and Shirley both saw not just the entertainment value, but also the potential in Susannah – hurrah – “A dancer trying to come out,” said Shirley – quite right! She also made mention of the technical content too – and the speed at which it was delivered; I was pleased for Susannah to hear these things referenced, credit where credit’s due. More deflatingly, Bruno coined the routine ‘Car Crash Miranda’ not Carmen Miranda, and Craig said the best part was the floorwork at the end (or rather, words to that effect!). Duly, when the scores were announced, we knew where we stood. A ‘1’ from Craig. Boos and jeers erupted from the audience, and I must admit we were taken aback by such a low score. 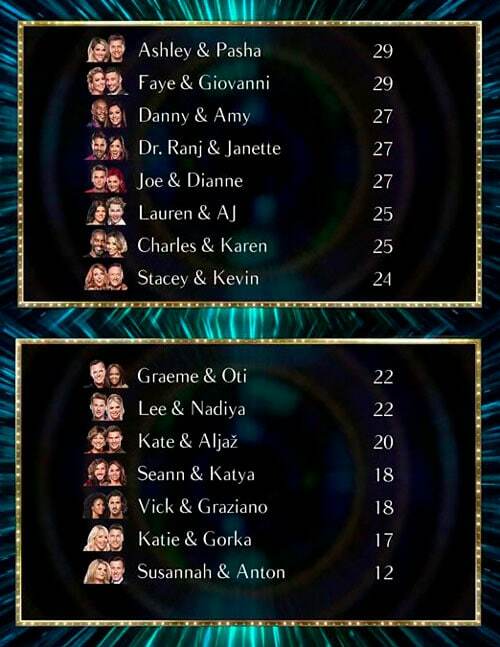 My goodness, I haven’t scored a 1 since Nancy Dell’Olio (our week 1 waltz scored 12 points again with a 1 from Craig). Susannah was pragmatic and said it could have been worse if we’d received a 1 from each judge, but at least the 3 from Shirley and 4s from Darcey and Bruno bolstered us to a round dozen. It placed us bottom of the leaderboard though… obviously not the soaring start we were hoping for, but looking on the positive side, the only way is up! With training almost complete for our Week 2 Foxtrot to that Sinatra classic ‘They Can’t Take That Away From Me’, we’re on a roll, just you wait and see! Tune in to BBC1 at 6:30pm on Saturday and watch us make a comeback! Don’t forget, the voting opens this weekend too, so we’ll be counting on your votes to help us through to week 3! …Your support, my loves, is always appreciated! 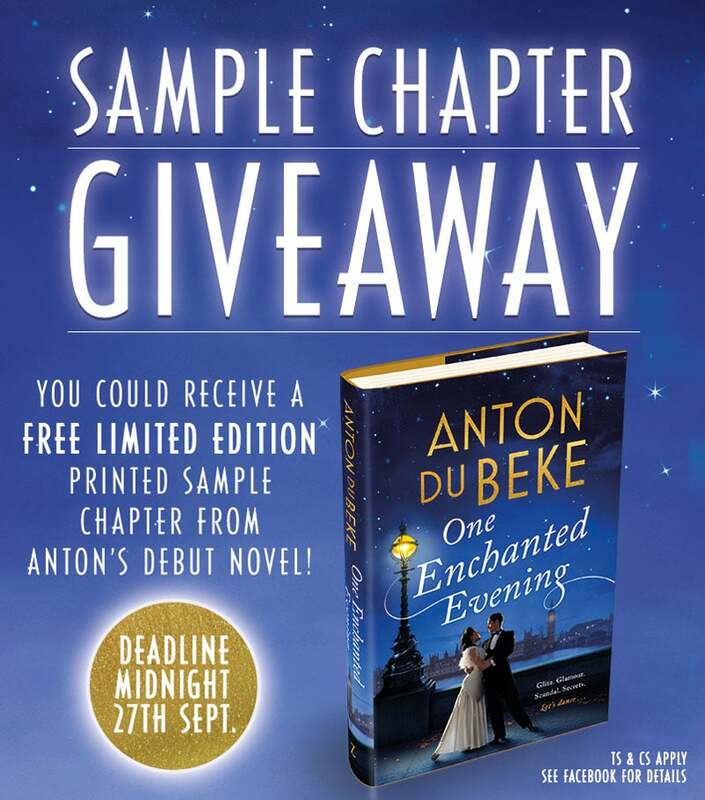 Meanwhile, there’s still time to be in with a chance of receiving a beautiful printed sample chapter from my upcoming novel, ‘One Enchanted Evening’. Head over to Facebook and comment and share this post to enter the random draw. 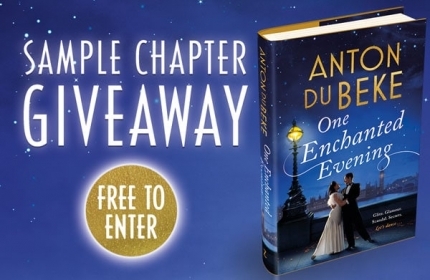 There are 50 sample chapters to give away! Deadline is midnight tonight though, so be quick!